Tag line: "The Evolution of the American Horror Film"
Narrated by Lance Henriksen, Nightmares in Red, White and Blue is a comprehensive documentary on the history of American horror films, starting as far back as 1912, when Thomas Edison produced the very first adaptation of Mary Shelley’s Frankenstein, all the way to the 2000s, when pictures such as Saw and Hostel helped define the genre for a new generation of fans. With clips from some 100 movies, as well as interviews featuring many of horror’s most influential personalities, like Roger Corman, Joe Dante and George Romero, Nightmares in Red, White and Blue leads us on a whirlwind tour of a century of American horror films, and the role our changing society had in determining what it was that scared us over the years. The film’s initial focus takes us back to my favorite era, the Universal monsters of the ‘30s and ‘40s, a period sandwiched between two World Wars (which proved every bit as horrific as anything the cinema had to offer). Nightmares in Red, White and Blue then walks us through the remainder of the 20th century, one step at a time, from the nuclear fears that gripped the ‘50s, displayed in movies like Them! and The Day The World Ended, to terrors from outer space (Invaders from Mars, Invasion of the Body Snatchers). The ‘60s saw yet another shift in the genre, launched at the start of the decade with Alfred Hitchcock's Psycho, and the introduction of gore by way of Herschel Gordon Lewis' Blood Feast. The late ‘60s and ‘70s reflected the horrors of Vietnam, in both mainstream Hollywood (Rosemary’s Baby, The Exorcist, Jaws) and the growing Independent scene (Night of the Living Dead, The Texas Chainsaw Massacre, The Last House on the Left). 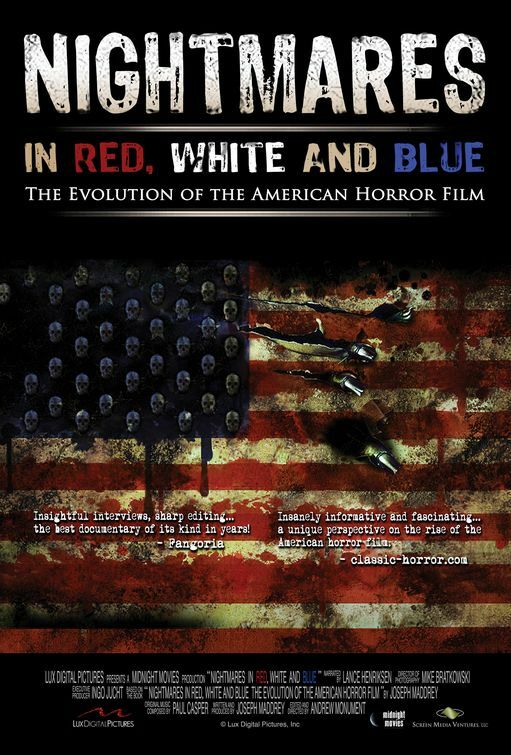 A large chunk of Nightmares in Red, White and Blue is dedicated to the ‘80s, arguably the genre’s most prodigious era, including the slasher phenomenon (Halloween, Friday the 13th), the works of Stephen King (The Shining, Christine, Cujo) and the decade’s re-imagining of the classic monsters (The Howling, The Lost Boys). Serial killers seemed all the rage in the ‘90s (Silence of the Lambs, Candyman, Se7en), while the new millennium was steered by the tragedy of 9/11, an event which changed the country’s perception of the world and, with it, the movies that gave us nightmares, from torture (the Saw series) to remakes that upped the level of violence (2003’s The Texas Chainsaw Massacre, 2004’s Dawn of the Dead). Nightmares in Red, White and Blue covers all this, and a whole lot more besides. You would think the history of American horror movies offered enough material to fill an entire miniseries, yet, somehow, this documentary does the genre justice in only 96 minutes. 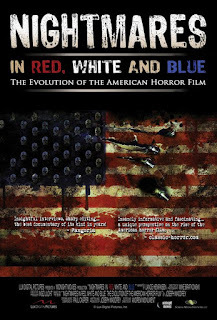 If you’re a fan of horror, Nightmares in Red, White and Blue is one film you can’t afford to miss. I liked this one. It makes an interesting double-feature with American Grindhouse, since they cover some of the same ground, but go in different directions.